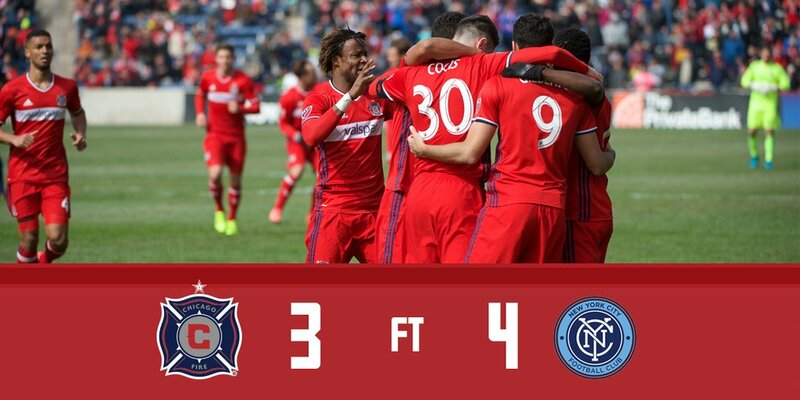 An exciting opening day MLS match between the Chicago Fire and New York City FC saw City hold on for a 4-3 victory. All seven goals in the game were scored by different players and there was no shortage of opportunities for even more goals. The Fire had an early chance in the second minute as Kennedy Igboananike put a nice pass through to Gilberto, but his shot was blocked after a cut back and the attack petered out. It was not long before City had their first good chance about a minute later as a blocked shot in the box fell to David Villa, but his shot was right at Matt Lampson. David Accam used his speed in the sixth minute to beat his man, but his shot was saved by City’s Josh Saunders and Arturo Alvarez’s follow up was well over the bar. City opened the scoring in the 10th minute when Thomas McNamara picked up the ball outside the box and hit a wonderful goal to the top right corner off the post as there was no chance for Lampson to make the save. Gilberto had another chance to score just a few minutes later after getting behind the defense. There was contact in the box and Gilberto went to ground, but no penalty was given by referee Armando Villarreal. The 17th minute saw Khiry Shelton get a shot off, but Lampson was there to prevent the deficit from doubling with a relatively easy save. Razvan Cocis leveled the game in the 19th minute with a beautiful run from midfield while Alvarez delivered wonderful ball over the defense and it was easy for him to bury the goal in the bottom right. Cosis tired to make it a 2-1 lead for the Fire in the 23rd minute after a City turnover in their final third, but his attempted chip was not nigh enough and easily caught by Saunders. City made it 2-1 in the 29th minute thanks to a blunder in the box by two Fire defenders. Joao Meira and Michael Harrington both went to clear the ball, but collided and it fell for Taylor to slot it home. Meira hit Harrington in the forehead with his boot and caused a laceration, but Harrington came back on the field after getting patched up. City made it 3-1 in the 36th minute after Shelton was able to burst past his defender and also dribbled past a caught out Lampson while he maintained his balance to but the ball in the back of the net. Gilberto had another chance in the 41st minute, but his shot was blocked by Saunders again while Saunders came up big again in the 42nd minute getting his boot to Accam’s chance. Accam had one final chance before halftime, but once again the ball was saved by Saunders. The Fire started the second half with Jonathan Campbell coming on for an injured Gilberto, who had a very good first half performance. Gilberto’s absence led to David Accam being moved up top. The Fire were able to get right back in the game thanks to Accam’s pressure on City defender Ethan White. Accam got the ball away from him, forced Saunders to commit to him, and set up an easy goal for Igboananike in the 49th minute. Accam had a chance to level the score a short time later after getting behind the City defense, but could not keep his feet as he was unable to even got a shot away. In the 60th minute, Alvarez put in a nice cross to Accam, but his shot was not strong enough and the post was covered well by Saunders. City were able to restore their two goal lead with McNamara hitting a cross in the box that found Mix Diskerud and he blasted his volley to the lower right corner. Accam nearly made it a one goal deficit again with a free run in the 67th minute, but Saunders came up with yet another big stop and the ensuing corner led to nothing for the Fire. The Fire were awarded a penalty in the 72nd minute thanks to a hand ball by Shelton in the box off a corner kick. Accam took the penalty kick and sent Saunders the wrong way to make it 4-3. City nearly put the game beyond doubt in the fifth minute of stoppage time. David Villa was one on one with goalkeeper, but Lampson stopped his shot and the game remained 4-3 to City. That is how the game would finish as the Fire could not mount one final attack. Both managers were coaching their first MLS game with Patrick Vieira coming out on top ahead of Veljko Paunovic. Frank Lampard was not in the lineup for City as he missed the match due to injury. The Fire had 12 corners to just one for City. City played a high line with their back four and it led to 7 offsides for the Fire. It also caused problems for City as the David Accam was able to use his speed to get past the back four defenders. Full game stats can be found here via MLS’ website. Jonathan Campbell made his MLS debut to start the second half when he subbed in for Gilberto. Joey Calistri also made his MLS debut when he came on in the 81st minute for Razvan Cocis. Chicago faces Orlando City on the road Friday night while City faces Toronto FC in their home opener on Sunday afternoon.